This First Aid at Work course covers all aspects of First Aid and meets the requirements of the Health & Safety (First Aid) Regulations 1981. The regulations require that “an employer shall provide, or ensure there is provided, such numbers of suitable persons as is adequate and appropriate in the circumstances for rendering first aid to his employees if they become ill or injured at work”. 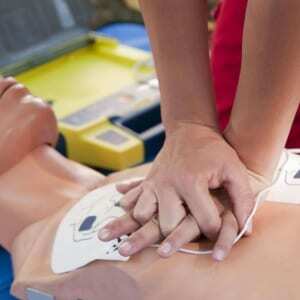 The course includes the safe use of AED’s (Automated External Defibrillators). Fist Aid at Work qualifications are designed to help organisations meet the minimum requirements for First Aiders in accordance with Health & Safety First Aid at Work Regulations (1981). Delegates will gain the knowledge and skills to effectively perform a wide variety of First Aid procedures in the Workplace and deal with incidents until the arrival of the Emergency Services. Generally this First Aid at Work qualification is suited to larger organisations where the company employs in excess of 50 employees and/or is situated over multi sites and/or the nature of the business is catagorised as a medium to high risk environment. Suitably qualified “First Aiders” must always be available whilst the business is operating. Health and safety administration and the duties of the first aider. Wounds and bleeding and the circulatory system. Emergency life support. Cardio-pulmonary resuscitation (CPR) including the safe use of AED’s. Employees who wish to gain an understanding of First Aid and take on the roles & responsibilities to become the Works “First Aider”. Any responsible employee over the age of 16 who is physically capable of assisting a casualty as a result of illness or accident at work. This course will require the provision of a suitably sized room to allow all candidates adequate space to practice various practical elements as part of their training. Suitable comfortable clothing should also be worn by the delegates for the course.